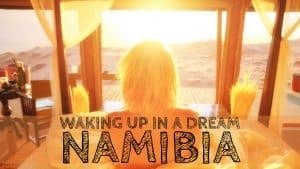 It was a sad day when we had to leave Namibia and cross the border into Botswana. We had come to admire the desert country during our month there. We felt especially fond for the Caprivi strip. However, we crossed over the Ngoma border post and geared up to explore more of Africa. The brand new Chobe Water Villas were awaiting us. 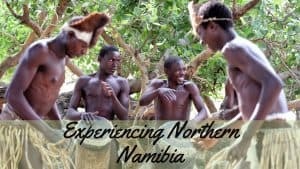 We didn’t miss Namibia too long, though, because two hours later we were crossing the Chobe River and getting our passports stamped back into Namibia. It had been a long day of driving from the Katima area. Filled with attempted bribery, sweltering heat, and an African border crossing. 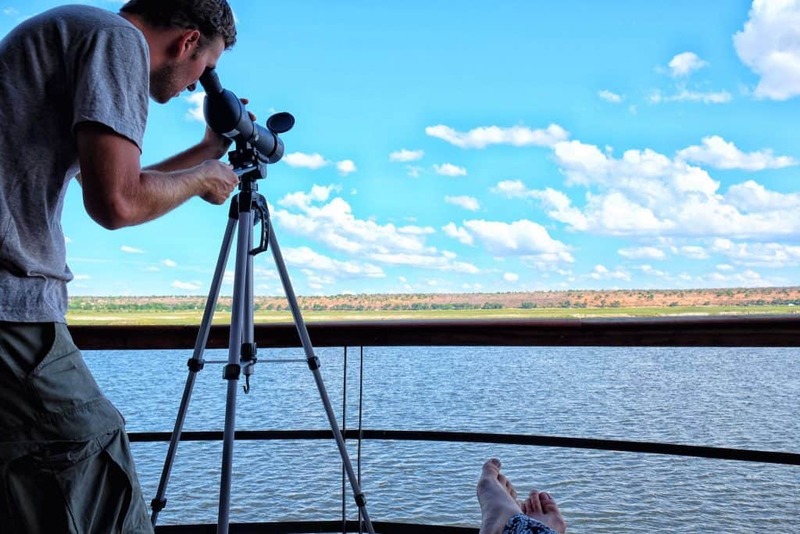 We were beyond excited when our boat pulled up to the brand new Chobe Water Villas on the Namibian side of the Chobe River. It is the first African lodge we stayed at located on a river. 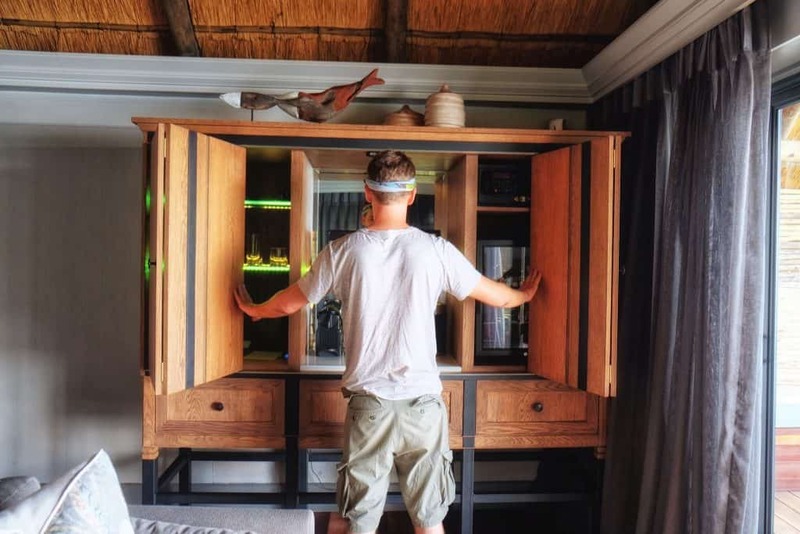 It’s also the most modern accommodation we have seen in Africa. Walking into the main area transports you into a varying array of time zones and locations. The interior was decorated in chic white and gray décor and stark shapes. 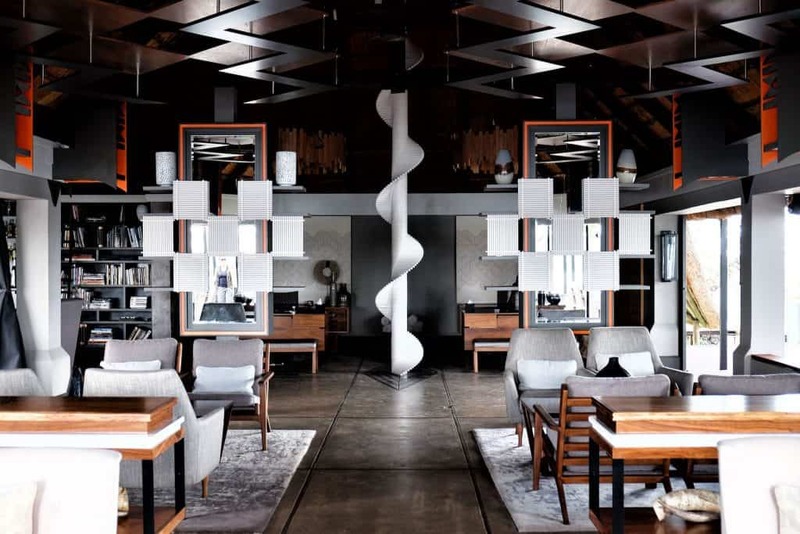 Exploring the architecture and decoration of the hotel leads to sources of inspiration from around Namibia. From the skeleton of a whale, to the seasonal rains that bring life. 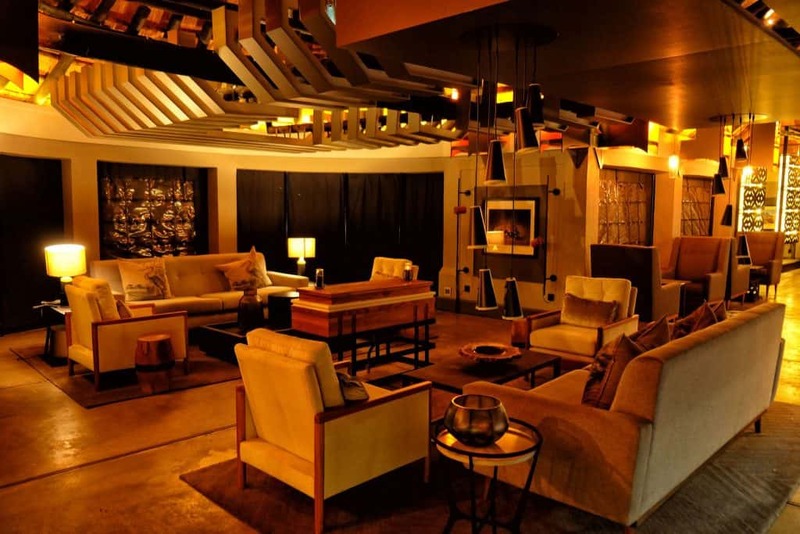 The lobby is certain to entertain guests as it features a self-service bar, coffee station, a library full of Afri-chic books, and a cinema room. I knew we were in for a day time treat when I walked out onto patio area and was faced with a giant infinity pool, next to an in-ground boma perfect to enjoy a round of sundowners. With the heat of the African summer setting in, I knew we would be making use of the bar, books, and the infinity pool. 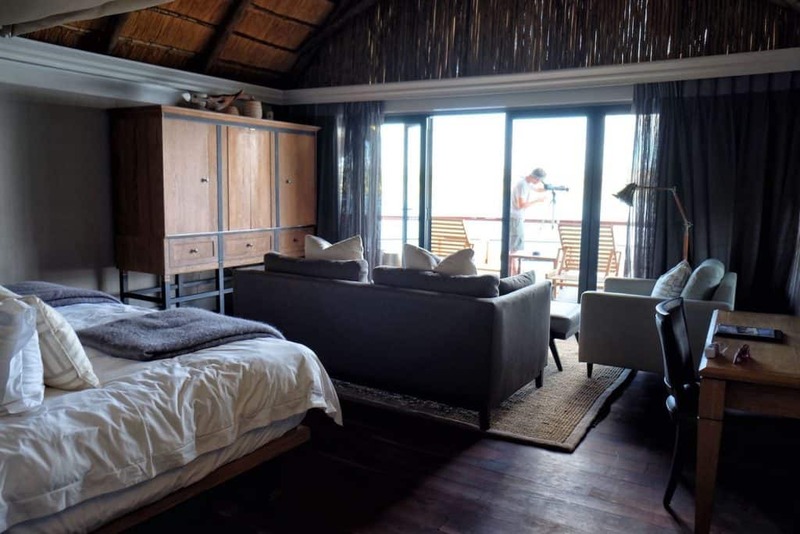 The rooms – or villas – I should say, at Chobe Water Villas are all set on stilts above the Chobe River. All across from the famous Chobe National Park and Sedudu Island in Botswana. The villas were spacious and housed bells and whistles like their own espresso machine and mini-bar. Cameron made full use of the game finder while I was able to chill out with a new book on the back deck on the river. We had a great nights sleep in the massive comfortable bed, with an air-conditioned canopy called the evening breeze. (didn’t I say this place was modern?). Now, Cameron and I are not morning people, but we made the extra effort to wake up for sunrise every morning. 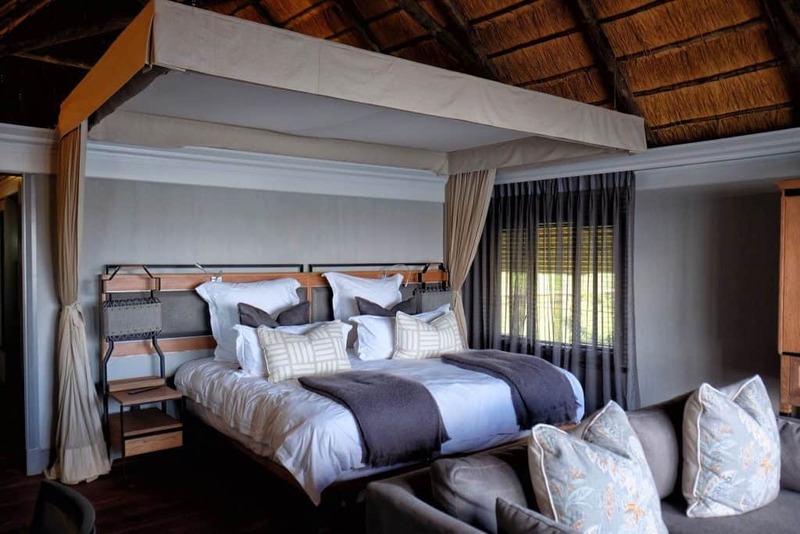 The rooms are in the perfect spot to watch the sun rise up over Southern Africa. Watching Africa come to life from the banks of the river is magical. 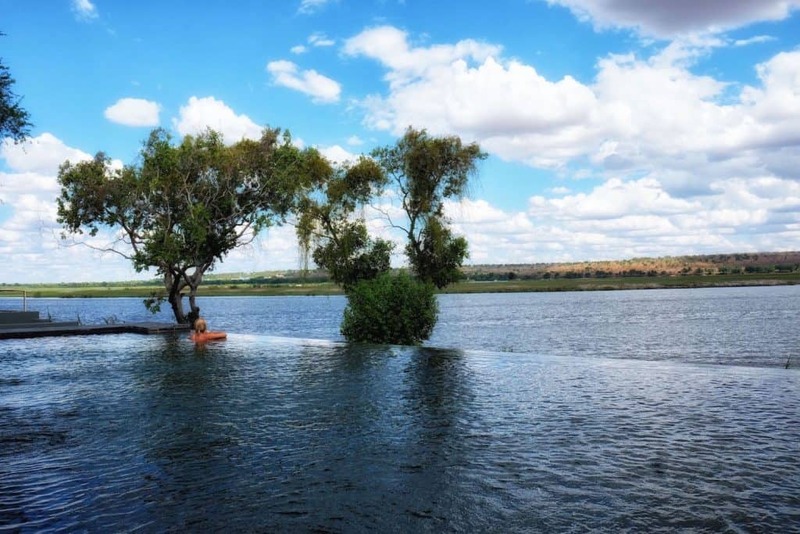 On our first day, we made our way across the river and back into Botswana into the Chobe National Park. 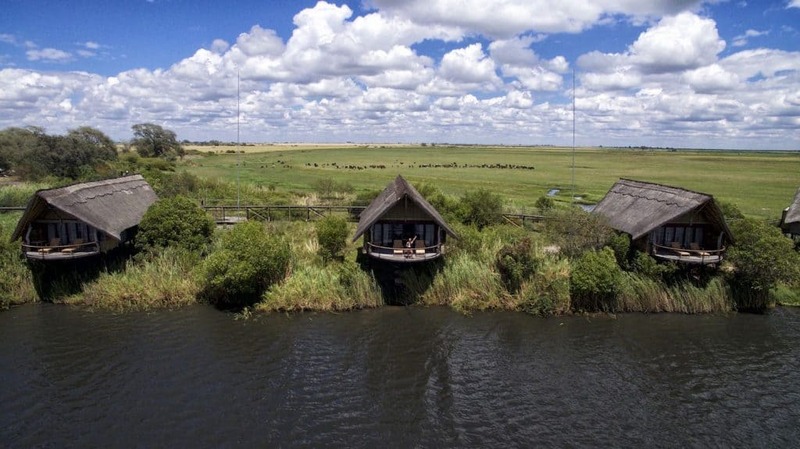 Chobe Water Villas organizes trips into the park for guests on either a half or full day safari basis. 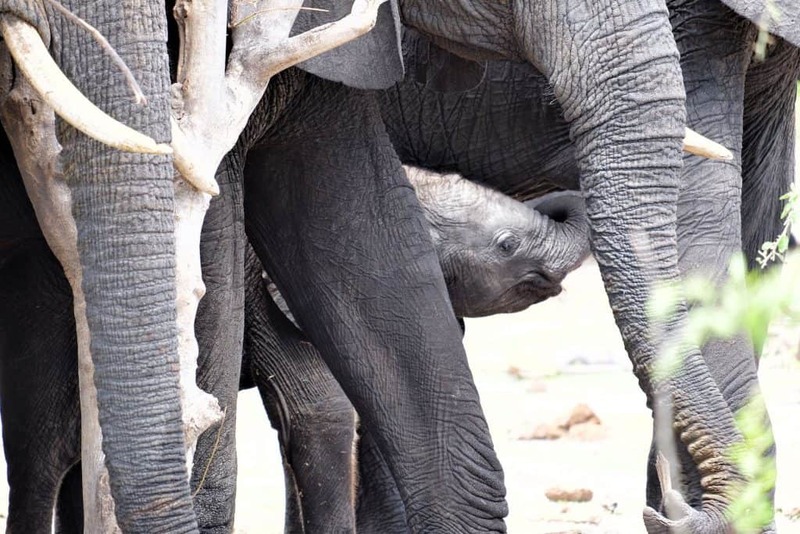 We choose to do a morning game drive and saw a plethora of elephant, newborn impala, vultures, and buffalo. We kept our fingers crossed for a leopard sighting, but unfortunately, it just wasn’t our day. 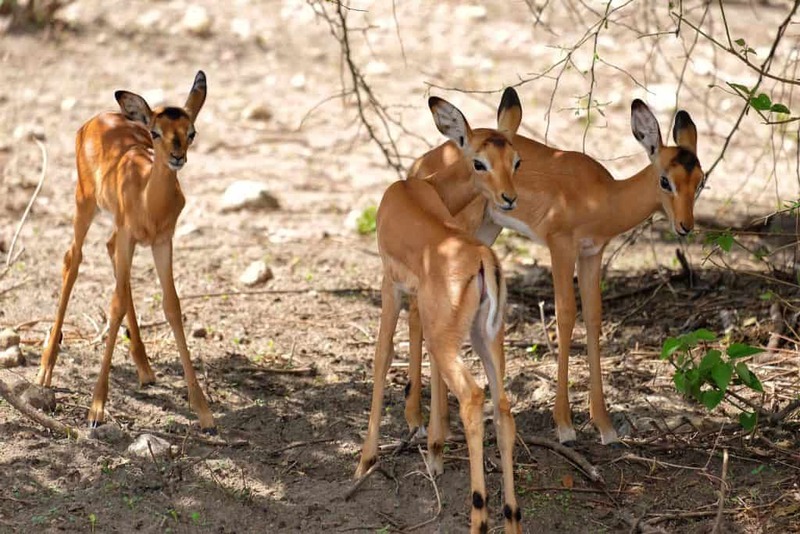 Chobe National Park has one of Africa’s largest concentrations of game. 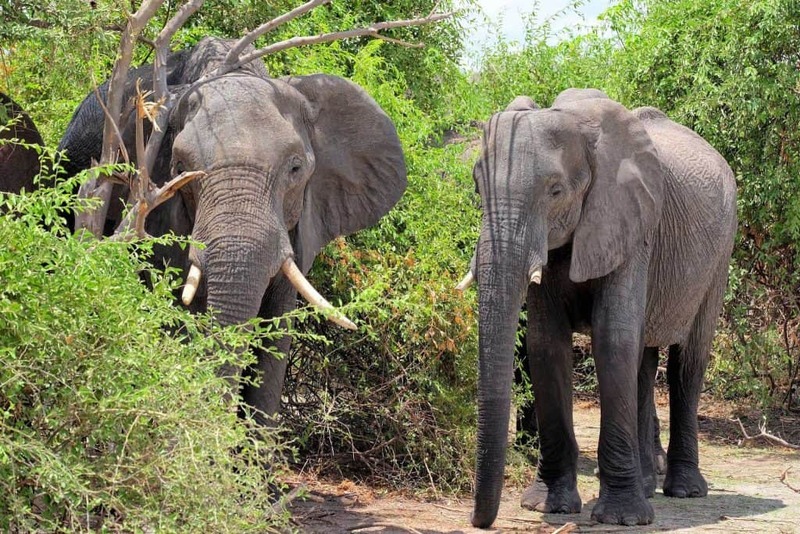 They have a staggering amount of elephant in the park as well as the rest of the big five. We had a leisurely ride back into Namibia with the team and finished the afternoon with a dip in the infinity pool. 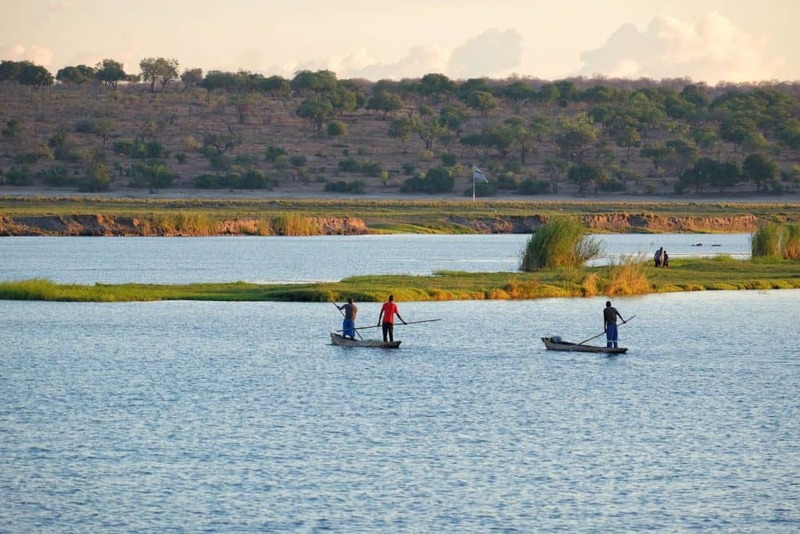 Evenings are a special time on the river as tourists set out for a boat safari into Chobe National Park. The boat safaris get you up close and personal (but not too close) to the hundreds of hippos, crocs, antelope, and abundant birdlife around the water. All of this, is enjoyed with snacks and sundowner drinks provided by the villas. 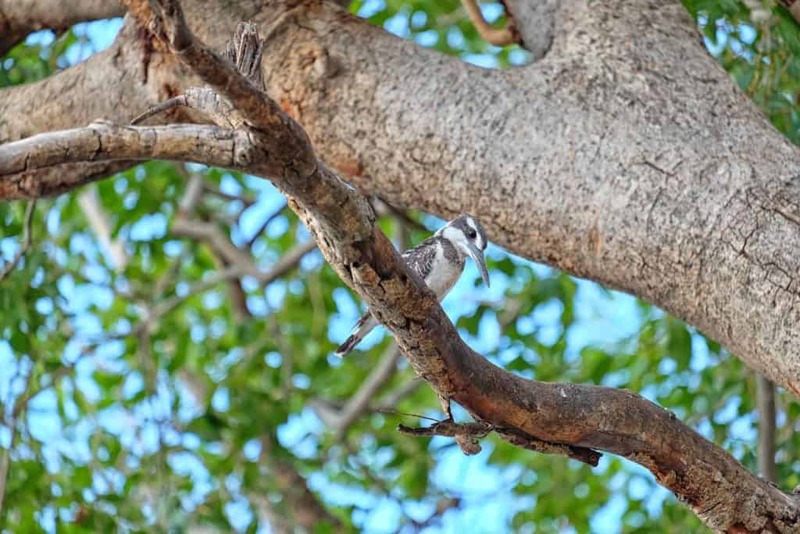 two feet away from the Pied King Fisher – my favorite! 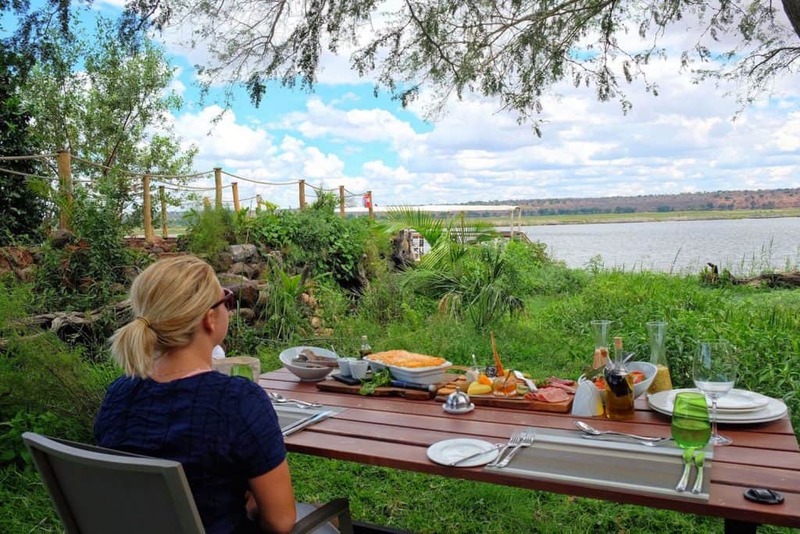 Speaking of snacks, I have to mention that the food we were served at Chobe Water Villas was some of the best we’ve had in Africa. Going with the whole modern theme the food at the lodge is multi-cultural and new era inspired. Breakfast always started with a nice cold plate of croissants, fresh fruit, and cheese while dinner is served in their 36 seater restaurant. Dinner is always a three-course meal with meat, fish, or vegetarian options and unlike many lodges, food here was an international affair. Dinner and breakfast were fantastic; however, r the real treat was served at lunch for us. The staff prepared for us a table in the private garden lithesome light food. Salad, charcuterie plate, mac & cheer, plus views equal happiness. Sunrise to sunset and everything in between at Chobe Water Villas was surreal. 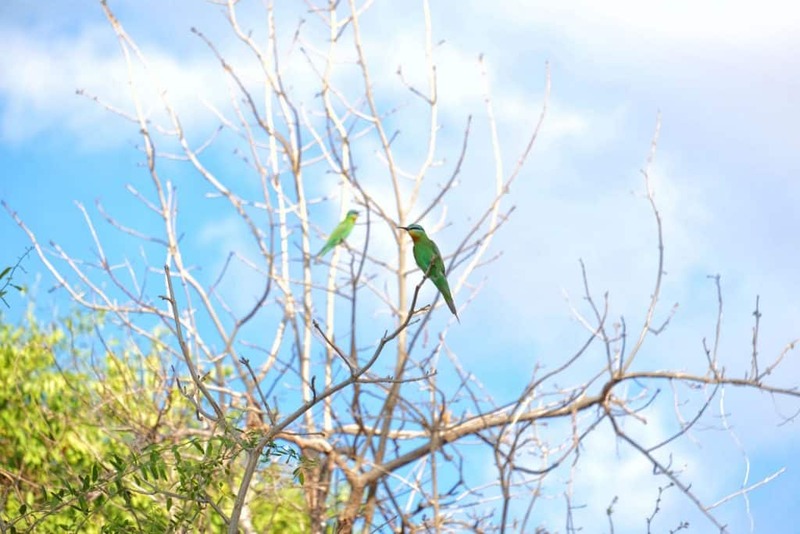 Day time activities are filled with wildlife viewing, riverside drinking, and leisure. 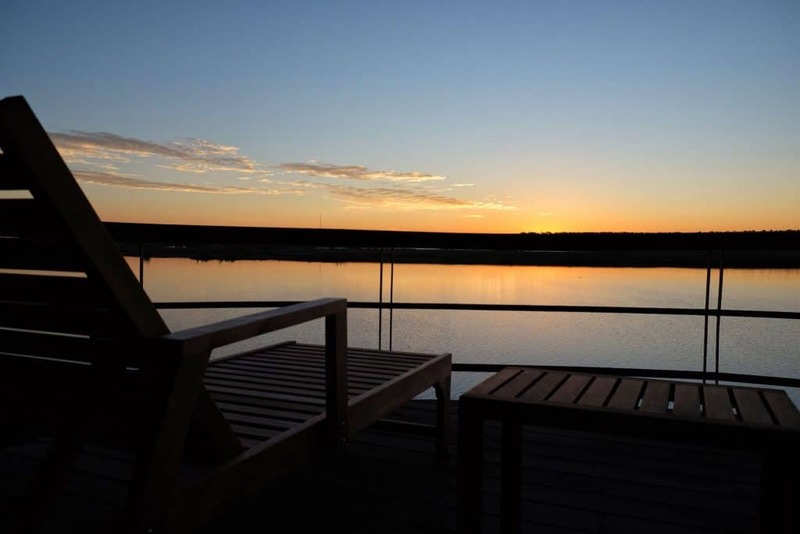 Evening are spent in relaxation enjoying the ambiance of the Chobe River with some delicious food. Because we were coming from Namibia we had to cross over the Ngoma border post into Botswana. Both Namibia and Botswana ran smooth border post operations here. US citizens do not need a visa to enter Namibia or Botswana, but be sure to state how long you want to stay in Botswana because the border officials will give you exactly that many days. If self driving expect to pay a road tax fee of 50 Pula. Payable by card at the Botswana border post. 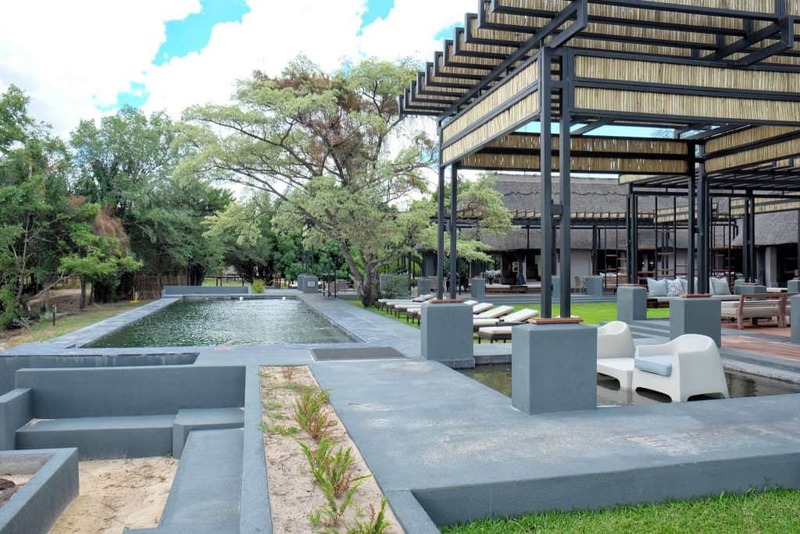 Chobe Water Villas covers the cost of the park entrance fee into Chobe National Park. If you are not staying at CWV expect to pay 120 Pula for a day pass. 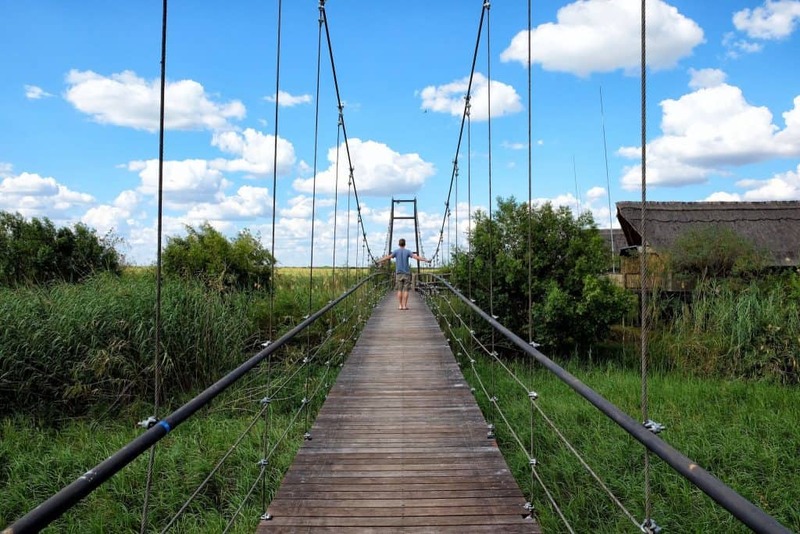 The gateway to Chobe Water Villas and the rest of Chobe is through Kasane, Botswana. This is a small town, but there are a number of ATM’s, coffee shops, restaurants, and a Spar. This is Africa, so watch your car where you park it in Kasane. I would recommend a guarded parking lot. Don’t have anything shipped to Kasane. I had to have a few things delivered to me so I was informed Kasane might be the best place to have international packages delivered. After a month, none of my packages were there and one had been signed for under someone named “George.” This is Africa. 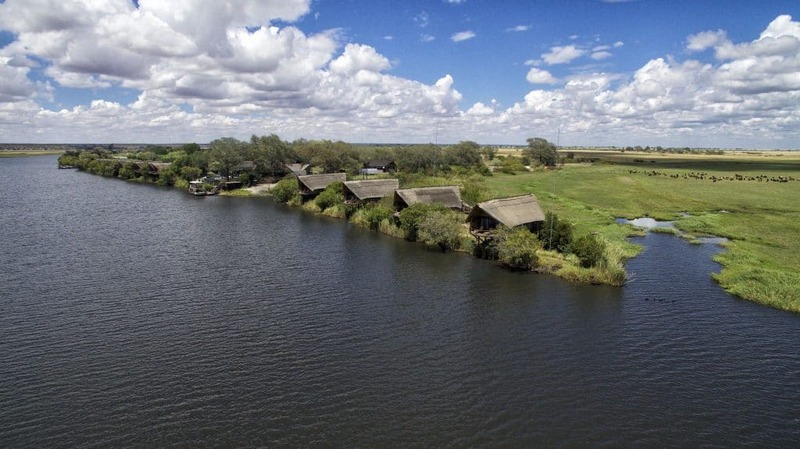 A stay at Chobe Water Villas include full board, drinks, and all activities. Thank you to the Chobe Water Villas for partnering with us on our stay. As always, all opinions expressed are our own.